Horrible picture I know but it was all I got after a sweaty & lights off hot yoga workout. For this week's segment of The Beauty Tester series I stepped out of my normal workout comfort zone, which is usually weight training and cardio and tried Hot Yoga for the first time. I have been hearing so many positive things about this and I figured it was time to give it an honest beauty review. I believe that beauty starts from within and how we treat our bodies physically and mentally so I felt like this was a perfect activity to review. My Expectations Before I Tried It: I have tried regular yoga a number times before and to be completely honest, I am always bored out of my mind. I just can never shut my mind off and get in that fully zen mode and be serious all at the same time. Plus I have always felt that for a workout to feel effective to me, I like to have a good sweat and regular yoga just doesn't give me that. 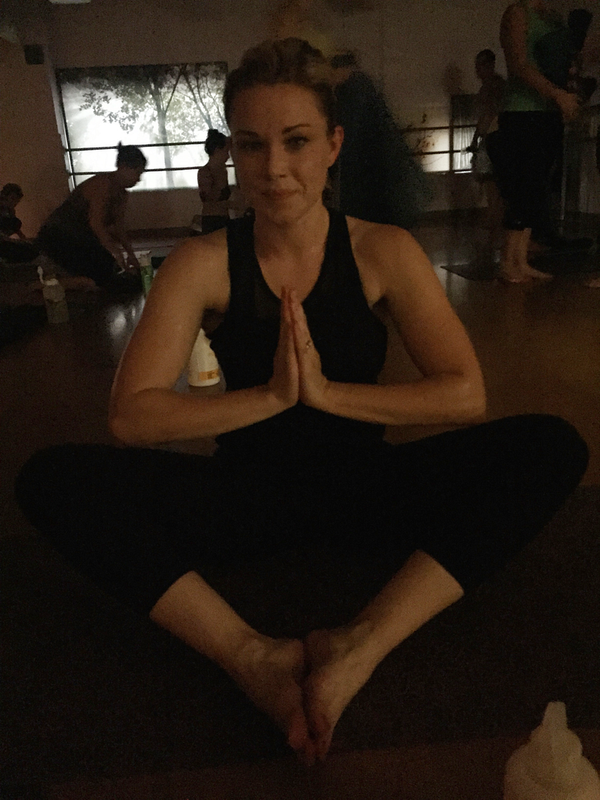 Even though this was "hot" yoga I went into it with the same expectations that I have had about regular yoga. So I figured it was going to be hot AND boring haha. Cost: The studio I went to charged $12 for a single class, $59 for untimed monthly membership and $79 for 10 classes. See my Instagram for the full details on where I went. Prep or Directions: My awesome neighbor is the one who initially asked me to go with her so she told me to wear light weight clothing, bring a yoga mat + towel and TONS of water. She also said it's best to not wear any makeup but I figured I wasn't going to sweat that much plus I wanted to take pictures after for the blog so I didn't bother washing my makeup before heading out with her. Bad idea ha! See raccoon eyes above. When we got to the studio, we entered a dark, very warm room with candles lit all the way around. There was relaxing spa music playing softly while everyone was finding their spots and getting situated. It felt very calm. It was a full class and thankfully we got a spot right next to the door, which I was happy about in case I needed to escape haha! I laid out my yoga mat and started stretching like everyone else was doing. The instructor came in, gave us a few words of inspiration then started the class. In the first 2 minutes I realized this was nothing like boring regular yoga. Results: The class was an hour long. Five minutes in I was completely drenched in sweat. It was HOT and it felt like as the class progressed it kept getting hotter but I could tell my muscles were loving it and loosening up from all the weight lifting that I have recently been doing. We worked on core, balance flexibility and strength. A few times it got so intense I wanted to just sit down on my mat in child's pose and take a break but my mind was present and I wasn't on my phone or being distracted by anything else so I kept powering through and that felt so amazing mentally. As the class was ending we did a little meditation and at that moment I knew I was hooked to this. For the first time in weeks (maybe months) I felt like I was able to let all of my stress and anxieties go and fully be present in a workout. My Rating: A++! This is one of the most intense and empowering workouts I have ever done. If you have ever been curious about Hot Yoga I highly recommend giving it a try. You will be so happy you did! Did you find the mixture of heat and exercise messed with your blood sugars? I always go low when those two mix. I have my ways of staving off lows with regular yoga but add heat and it seems uncontrollable. Amie! Great question! Yes, I did notice a small drop in the beginning from the heat but I kept Clif Shot Bloks with me and popped a few when I noticed my blood sugars dipping a bit. I also started the class a little on the higher side (160) because I also tend to get super low when I mix heat with exercise. So the higher blood sugar before starting helped as well. Awesome. I tend to start a temp basal OR do extra snacks and start a bit higher. So it's nice to hear that there isn't a magic secret. I have been wanting to step up my yoga game and try hot, BUT, I'm so curious - did the heat get to you and make you feel faint at all? I can totally see getting way too hot and passing out in class. Not cute. LOL! Embracing the sweat is the key to hot yoga.Quite a few people have a tendency to feel self-conscious about the way that they're sweating a ton,so they're wiping it always.It's better just to let the sweat flow.When you wipe it,you close your pores, and that means your body needs to deliver that sweat again to cool that territory.It's best just to give it a chance to flow and understand that everybody around you is sweating just as much.